You knew it wasn’t going to be easy. New York Rangers’ captain Ryan McDonough scored 9:37 into overtime to beat the Washington Capitals 2-1, staving off elimination and forcing Game 6 back at Verizon Center on Sunday. McDonough took a pass from Derek Stepan and beat Capitals goalie Braden Holtby with a wrist shot from between the circles. It was McDonough’s second goal in 10 games in the playoffs. The Rangers are 9-0 when facing elimination at home since Game 4 of the second round in 2008, which is an NHL record. Overtime was required because Chris Kreider tied the game at one with his third goal of the playoff season, a one-timer from the top of the left wing faceoff circle, on a pass from Stepan. Curtis Glencross gave the Caps a 1-0 lead midway through the final frame on a breakaway goal. Rangers goalie Henrik Lundqvist made the initial save, but Glencross stuck with it and banged home the rebound over the sprawled Lundqvist. It was Glencross’ first goal of the second season. Glencross’ goal came courtesy of a terrific defensive play by Tom Wilson in the Caps zone, and a beautiful clearing pass from defenseman Matt Niskanen. Both goalies were again remarkable. Holtby made 41 saves; Lundqvist 28. Holtby made several “how’d he do that?” saves, including robbing Martin St. Louis in the first period from point blank with a toe save. St. Louis fanned on the rebound and Niskanen guided the puck to safety. The Caps were fortunate at times as well. Early in the second, the Rangers’ Tanner Glass had a wide-open net, but Mike Green was able to get just enough of the puck milliseconds after the shot to deflect it to the corner. The Caps were also victims of bad luck. Late in the second period, it appeared as if the Caps took a 1-0 lead when a Niskanen slap shot from the point bounced off Lundqvist and into the goal. But the refs immediately waived the goal off, ruling that Joel Ward interfered with Lundqvist. On replay, Ward very clearly was not in the crease and it appeared not only was he pushed, but the Lundqvist himself initiated contact. Regardless, the Caps now face the daunting challenge of Game 6, still with one-game lead in the series, at Verizon Center Sunday at 7:00 pm EST. Neither team made good on two power play opportunities. Washington win the faceoff battle, with 52% won. Alex Ovechkin had nine shot attempts, but just two on goal. Ward paced the Caps with five SOG. 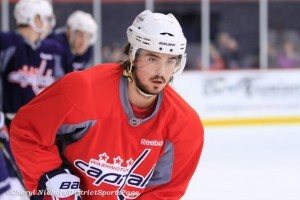 What is the biggest weakness of the Washington Capitals? It’s a simple question, but an important one. The playoffs have a way of exposing every weakness of every team very quickly. Knowing what those weaknesses are can help determine who the true Stanley Cup contenders are. One night after playing “playoff atmosphere” hockey to shut out the Boston Bruins, the Caps came out flatter than Stanley, needing a shootout to secure two points from the Buffalo Sabres, a team trying to secure its standing in line for the opportunity for the first pick in next year’s NHL draft. The Caps (38-23-10) are four points ahead of Boston for the seventh seed in the East and nine clear of Ottawa, which is the first team outside of playoff seeding currently. Boston now has two games in-hand over the Caps and the Senators have three. Evgeny Kuznetsov was the only player in the shootout to score. The Dallas Stars scored three power play goals and the Washington Capitals’ recent malaise continued as the Caps fell at home 4-2. The Stars concluded their five-game road trip with a fairly dominating performance over the homestanding Capitals, who have lost two in a row at home and 3 of 4 overall. Another trade deadline has come and gone. It’s a time when general managers try to inflate the importance of all the moves they made/didn’t make and a time when fans and analysts alike sit back and overestimate the impact a handful of depth players will have around the NHL. Excuse me for not planning a Stanley Cup parade in Washington after the Capitals added Tim Gleason and Curtis Glencross to the roster. I like both of these players. I’m not thrilled that the Caps have so few draft picks in what is supposed to be an excellent draft, but in the NHL where players outside of the first round rarely make the big leagues, I’m okay with making the types of deals general manager Brian MacLellan did in pursuit of the Stanley Cup. Washington Capitals first-year GM Brian MacLellan made another move in advance of Monday’s NHL Trade Deadline, dealing a second and third round pick in the 2015 draft to Calgary in exchange for forward Curtis Glencross. Glencross is a sturdy, rugged winger who has two 20-goal seasons to his credit in nine NHL seasons. He had nine goals and 19 assists for Calgary this season. He routinely plays long minutes against tough competition and rarely took an offensive zone draw for the Flames this season. Much like Tim Gleason, picked up Friday from Carolina, Glencross immediately upgrades the Caps toughness factor without bringing in a “dirty” player. The problem is that Glencross’ profile matches several players the Caps already employ, and his addition will probably mean subtraction of minutes for a younger, arguably more-talented player — specifically Andre Burakovsky. Rumors were floating that Burakovsky was going to be sent to Hershey — on paper anyway — to make the youngster eligible for the AHL playoffs. If the Caps don’t make another deal before the deadline, they’ll have to remove a forward from the roster to make room for Glencross. Maybe Burakovsky is it. Analyzing the roster and line moves all season, it’s become obvious that coach Barry Trotz isn’t ready to trust top-six minutes to Burakovsky or Evgeny Kuznetsov — and Nate Schmidt on defense — in the playoffs. The nightly tinkering to find a running mate on the top line is more evidence that Trotz isn’t comfortable allowing those youngsters the leash to handle that responsibility. Glencross isn’t the perfect fit there wither, obviously. He’s more skilled than Jay Beagle or Tom Wilson — at least at this point in their careers — but he brings the toughness and hard work Trotz tries to instill in that spot with an upgrade in talent. The Caps might not be done. They’ve still been linked to Erik Cole and Joffrey Lupul, two more forwards that could be a better fit on that top line with 8 & 19. But to this point, the Caps’ new GM had made two moves that look an awful lot like those low-to-medium risk, low-reward moves of his predecessor at trade deadlines of years past. Glencross and Gleason are both nice players, but they hardly move the needle on the Caps’ Cup chances. They make the Caps deeper perhaps, but not more talented. The biggest issue, then, is how the Caps see themselves. And it’s organizational, not just at the GM level. The Caps organization believes it has a Cup championship core, and they need to fill in around the edges. They’ve been operating around this premise for several seasons. But the truth is, they don’t have enough top-line talent. Alex Ovechkin and Nick Backstrom can’t do it all by themselves. This team needs to surround that pair with more talented players, not more role players.